In ayurveda there is 3 different doshas, or constellation types. We all have each of these doshas in us, but we tend to have one or two more dominant doshas. 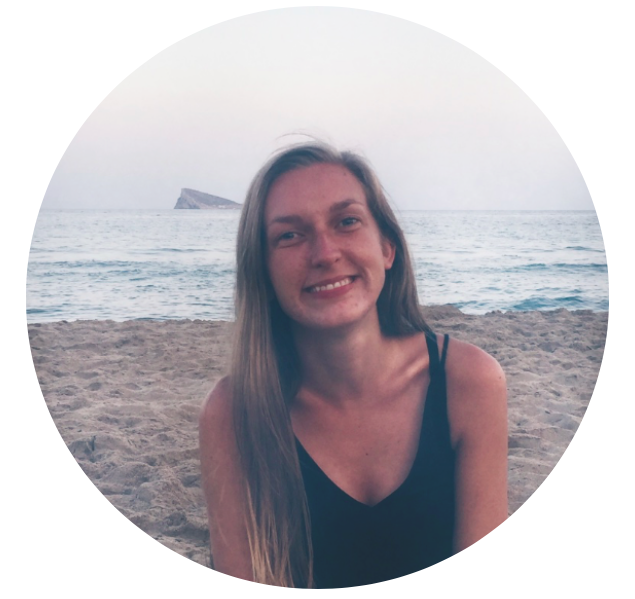 Based on these doshas you can find out what brings you out of balance, and what brings you into balance and what makes you the best version of yourself. 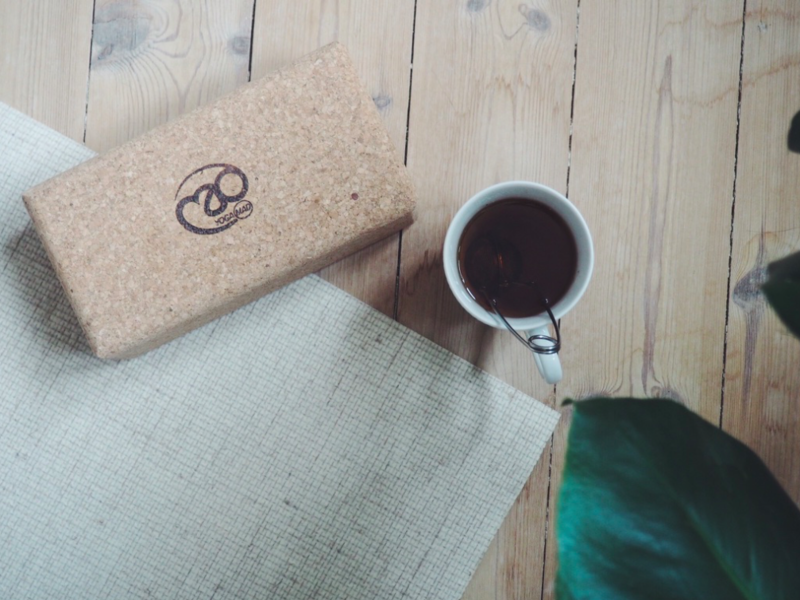 If you have no idea what ayurveda is, then I have written a little blogpost about ayurveda in general here, but today I want to write a bit about the 3 different doshas. 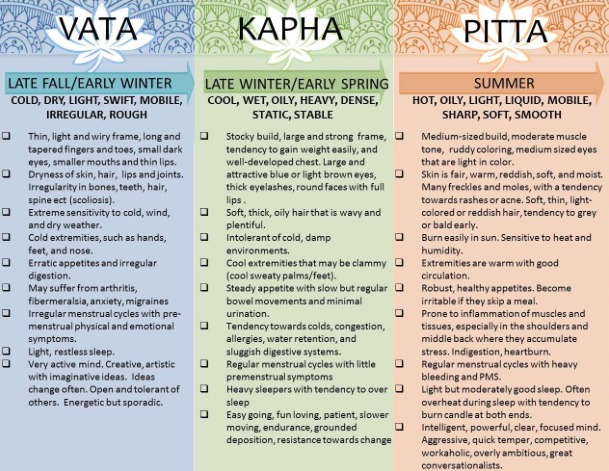 The 3 different doshas are vata, kapha and pitta. Below you will find some descriptions about the characteristics for each type and what brings them out of balance and what brings them into balance. You can take ayurveda tests several places online or in books, or you might even be able to see which one is your primary one simply based on the descriptions below. Characteristics: typical slim, small persons. Easy to see bones. Tendency to dry skin. Often have cold hands and feet, speaks fast and sleeps very lightly. Vata in balance: imaginative, enthusiastic, flexible, generous, easily gets friends, ready, happy, creative, good communicator, light body, does not care about routines, ordinary and predictable ways. Learns quickly, loving. Because vata is very cold, light and dry it needs warm, stability and routines. Vata in imbalance: easily gets out of balance during the winter and the cold months, and by stress, hard exercising or too much activity, travelling and instability. Easily gets constipated, shakes easily, easily looses appetite, sleepless, gets anxious, have a hard time making decisions and standing by them, feeling divided, dry skin, cannot stay still, worries a lot, anxious, indecisive, unfocused, do things fast, forgets to eat, gets overwhelmed by too much at once. Characteristics: Often big and strong. Skin is clear and eyes are moisture and beautiful. Hair is typically thick, shiny and waved. Strong appetite, good immune system, moves slowly and calmly, loves to sleep for a long time and deep. 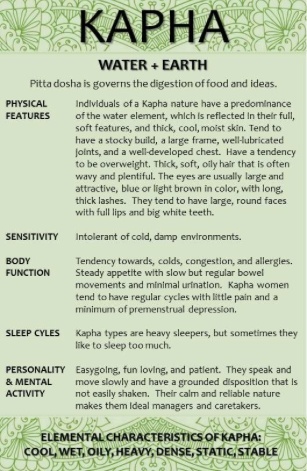 Kapha in imbalance: very lazy, depressive, greedy, turns inward, lung issues, slow, sleeps more than hours per night, feels heavy in body and mind, does not take initiatives, passive, lies on the couch, eats comfort foods, easily gains weight, jealous. Characteristics: medium building, is often strong and well proportioned. Have a sensitive skin, a good glow, glittering eyes with a sharp look. Hair is soft and thin. A pitta is warm and soft to touch, they speak sharp and precise. Pitta in balance: have lots of fire and energy inside, a big drive, is ambitious, competitive, leader, ask many questions, interpretive, reflective, energetic, intelligent, sharp focus, organised, impatient, warm, adaptable, strong appetit and thirst, disciplined, principle, perfectionist, independent, strong body, charismatic, passionated, good at businesses, healthy and strong appetit. Pitta in imbalance: impatient, frustrated, highly competitive, arrogant, judgemental, critical, angry, aggressive, burns out quickly, gets inflammations, gets skin rashes, looses hair early, high blood pressure, cynical, needs to cool down, feels exhausted, works too much, is a control freak, diarrhea, stomach problems. Once you know which dosha is your primary, you can also learn how to bring it into balance by learning about what foods are good for you, what kind of exercises are good for you, which routines etc. 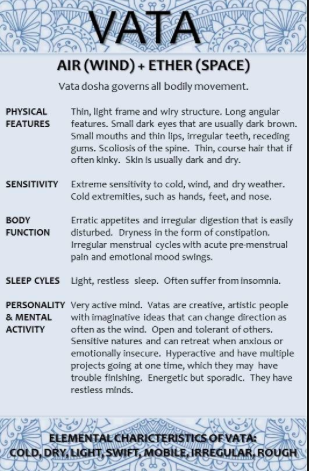 I can tell you that I’m without a doubt a primary vata, I’m slim, have a tendency to get easily cold, gets easily stressed out if I have too many things going on, love warm food and drinks and I have tons of ideas, but sometimes have a hard time sticking to routines – a typical vata. Some of the things I’ve learned through learning about ayurveda is what I can do to get more into balance. I can eat warm, grounding food, remember to relax and slow down and try to stick to some routines. Ayurveda is a very ancient philosophy which goes hands in hand with yoga and really looks at how you can prevent diseases, illnesses etc. rather than fighting them once they are there. 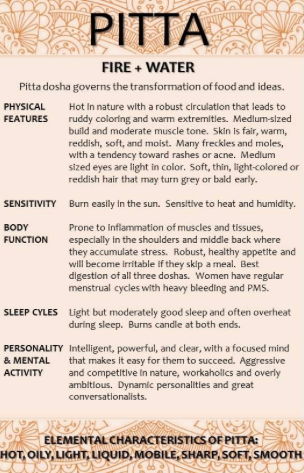 I’m interested to hear – what is your dosha type? Can you identify yourself based on these descriptions? Or have you taken a test?